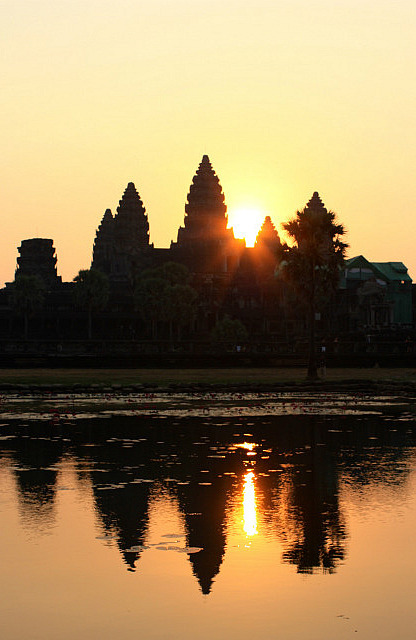 My trip to Angkor Wat was over a decade in the making. It all began with Wong Kar Wai’s 2000 film, In The Mood for Love. It’s an absolutely stunning film that became an instant favourite of Matthew’s and mine. It’s not everyone’s cup of tea, it’s quite slow and subtle, but we loved it. It wasn’t that it was ‘our story’ at all though in hindsight, it is littered with subtle ironies. 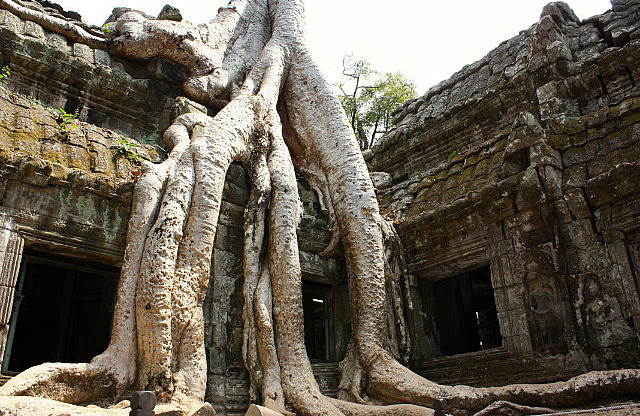 Without wanting to give too much away should you decide to see it, at some point, one of the characters goes to Angkor Wat and whispers their secrets and sadness into a hole in the wall of one of the temples and plugs it with a clump of grass leaving it sealed in the walls evermore. 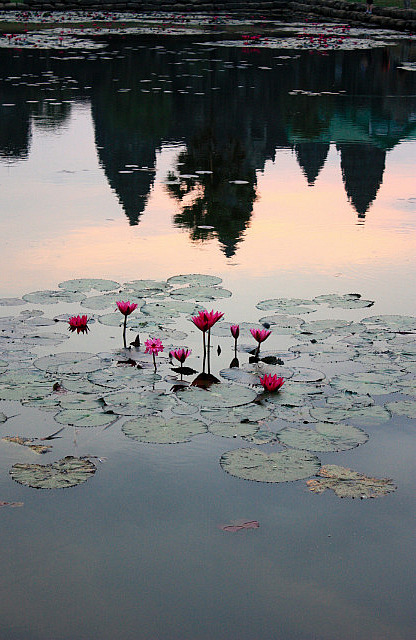 We never know what is said but it is such a beautifully poignant scene that once we saw it, we wanted to go to Angkor Wat. 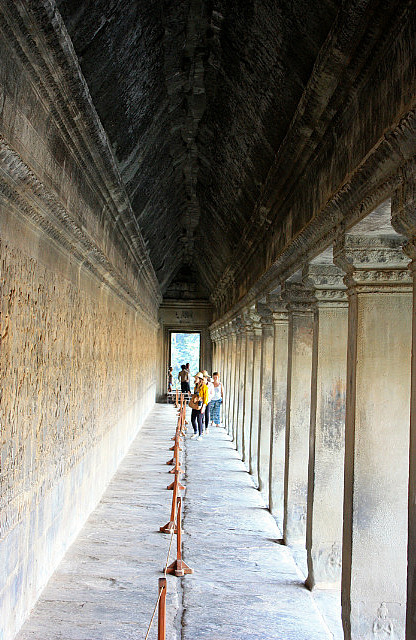 When I was building the itinerary for my Fool’s Journey, I structured it so that Matthew and I could rendezvous in Cambodia at the end, go to Angkor Wat, tell its walls our sorrow and leave it there ever more before returning home to embark on a new friendship. As the time drew closer, it became apparent that Matthew no longer shared that vision so I changed course and went to Thailand instead. When it came to building this itinerary, it occurred to me that I should still do it on my own and that in fact, it would be entirely more appropriate for me to do it that way. I got ready in the dark and stumbled down the stairs to find a packed breakfast and tuk tuk driver waiting for me – I love the Cashew Nut Guesthouse! 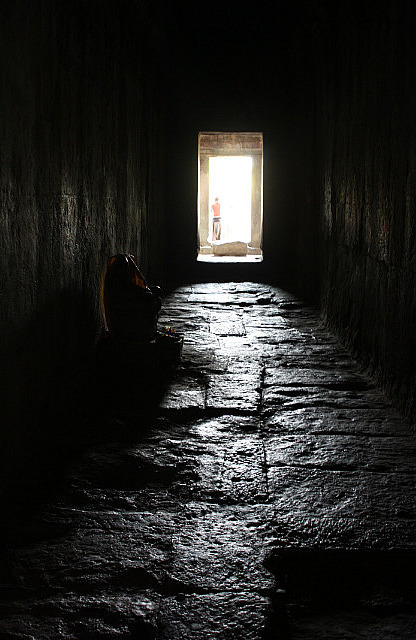 We made our way in pitch-blackness to the site of the eponymous temple, Angkor Wat. It was at this point that I realised I really hadn’t thought this plan through as I was faced with the task of clambering up and over ancient stairs and through decayed doorways in total darkness. Luckily, many of my fellow pilgrims were far more organised and so I tailgated a few to borrow their beams of light to guide me to prime position to see the sun rise. After about 20 minutes, a faint silhouette started to become visible and my trigger finger started to itch. I’m not talking about my M16 and the guy next to me eating with his mouth open, sucking his teeth and belching either! No, I of course refer to my friends Canon 450D and the Eight Wonder of the World coming into view in front of me. I must have taken 500 photos and had to laugh at my own hypocrisy. For years I used to bug Matthew about taking so many photos instead of just enjoying the moment. Of course I came to understand that that was how he enjoyed it and let him be, knowing that we could enjoy it all over again looking back at the photos which are sadly lost to me now. In the midst of it all though, I did heed my own advice and take pause to just marvel at the breathtaking wonder of it – an experience that no photo will ever truly capture. Once the sun cleared the monuments peak, the crowd dispersed and I was left to my own devices and this moment that had taken over ten years to arrive at through good times and horrendous. 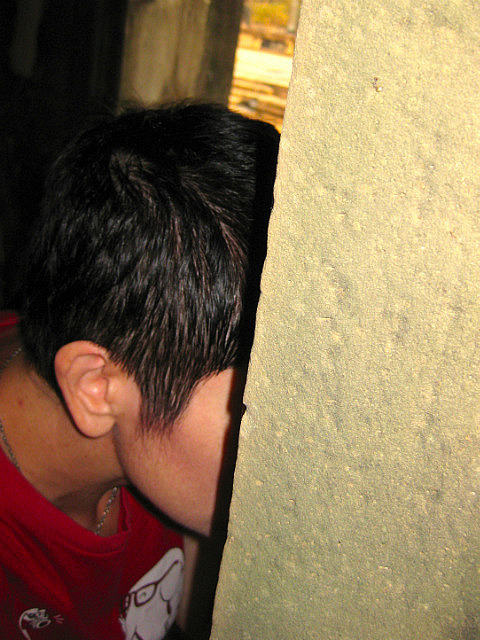 The only problem was, now that it was here, I didn’t really know what I wanted to whisper to the wall. So I did what I do – I sat down and wrote and wrote and cried and wrote some more until my message was clear. It was both bigger and simpler than I expected it to be. Now that I had my message, it was time to get tactical and work out if it was even possible to find a hole to talk to or to shove stuff into the walls of a UNESCO World Heritage Site. Getting the clump of grass was easy enough – I managed to tear that up from the expansive lawn I was sitting on while I wrote. I sat facing the main temple and thought it would be both too busy and potentially too patrolled and cordoned off for my little reenactment. I considered pocketing the clump and taking my chances but then a nearby sub-temple that seemed to be beckoning me caught my eye. I followed my instinct to find myself surprisingly alone within it’s walls with my choice of holes to whisper sweet nothings to. I’ll admit, I was starting to feel pretty silly but it’s what I’d come here to do, so do it I did! 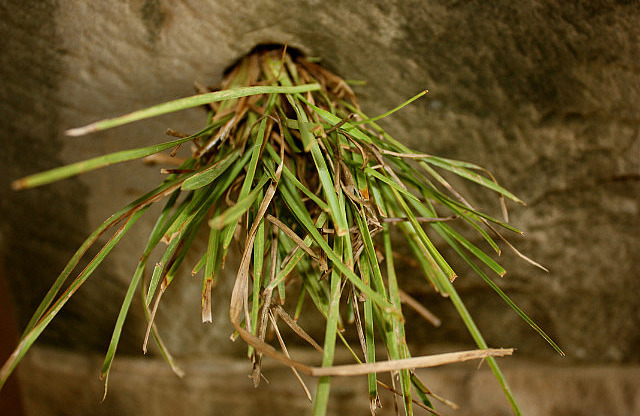 I whispered my message over and over until I was sure the hole properly understood and had duly noted all my caveats and addendums… actually there were none, just my simple message that I sealed with the patch of grass. As to what my message was? 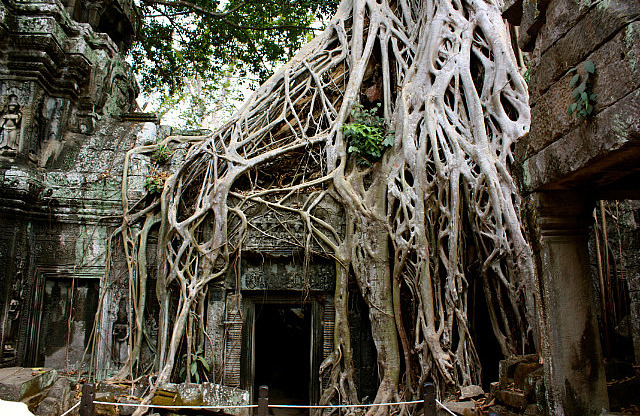 Well, that’s between me and Angkor Wat and there it will stay for all eternity! Having done what I’d come all this way through time and space to do, I walked away feeling lighter for it. 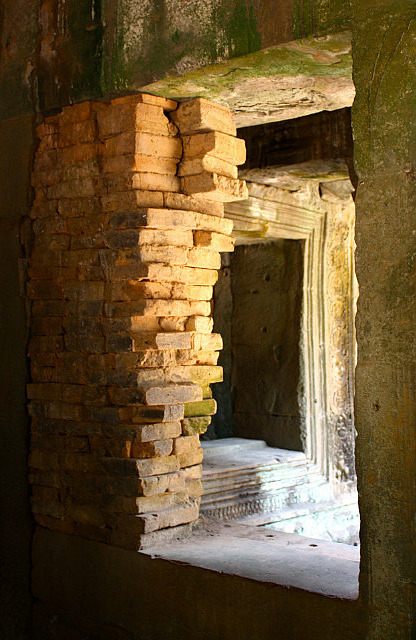 I headed to the main temple to explore its nooks, crannies and closely guarded holes. I ducked through it’s doorways, scrambled up its hundreds of stairs and gawped in awe at its ancient architecture. Several of its chambers are still in use today for active worship. I spent a good couple of hours marvelling at its majesty on both a macro and micro scale before returning to my tuk tuk driver and heading off to the next mega temple. 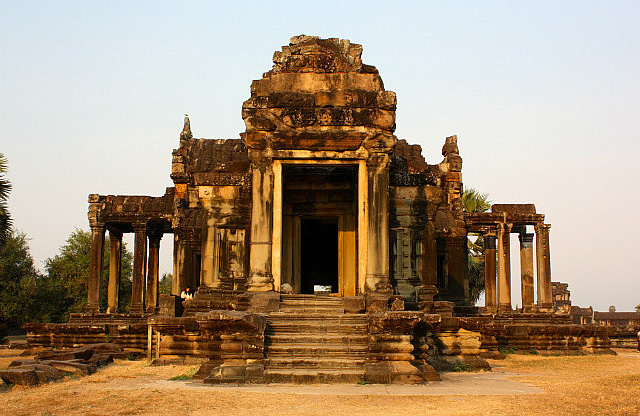 Angkor Thom covers over 9 square kilometres. 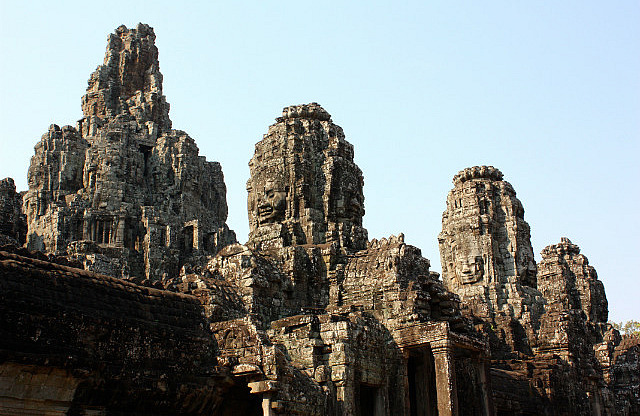 At its heart in the Bayon temple distinguished by the hundreds of smiling faces carved into the stone of its facade. Ancient rumour has it that the giant faces bear a striking resemblance to the king who commissioned it (not unlike the Pharaohs faces in Harrods who just so happen to look ever so slighly like Mohamed Al Fayed). 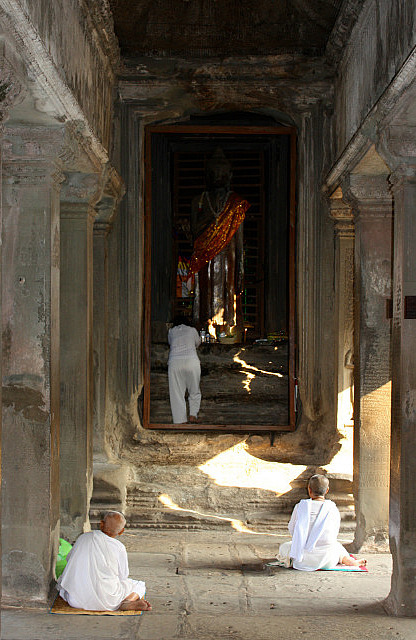 Further on is the Terrace of the Elephants, the Phimeanakas and the Terrace of the Leper King – each with their own set of steep stairs ascending ever higher towards the blazing sun. 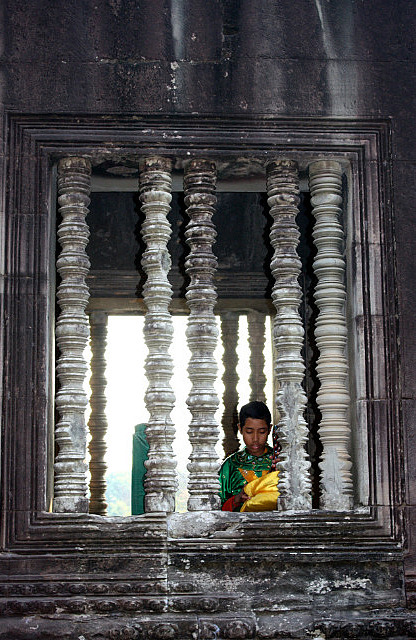 By the time my tuk tuk driver dropped me at the next temple – Ta Keo – I was well and truly starting to fade. 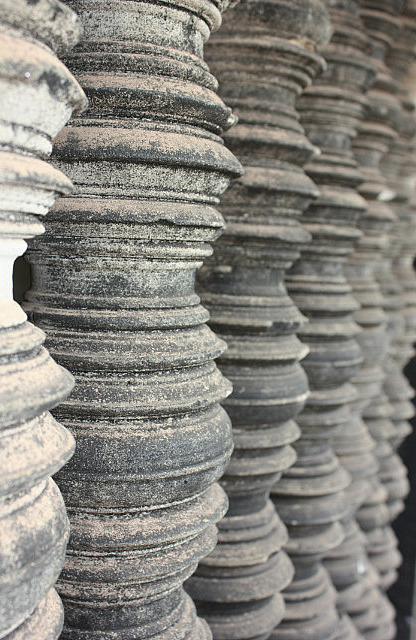 When I stepped though the final doorway of the outer wall and into the inner temple, my eyes were drawn up, up and up the original sandstone staircase of very shallow but tall stairs. The other temples had been retro fitted with wooden stairs overlaying the original stone work built in a time when people were apparently cross bred with mountain goats. There was no such luxury at Ta Keo. The mere site of it made my heart sink and legs buckle. I sat in the shade at the base a while and watched far fitter people than me balk at the top when facing the task of climbing back down. If they were struggling, I didn’t fancy my chances so instead chose to make sport of watching the faces of other people stepping over the threshold invariably drop at the same rate their eyes rose – many still made the climb, just as many kept me company at the bottom. I was just about all templed out but had left a little gas in my tank for the much anticipated final stop – Ta Phrom – known to many as the ‘jungle temple’ and to many more as the ‘Tomb Raider temple’ – the former because it has been purposefully left and preserved in the state which it was found, tangled in the roots of encroaching trees; and the latter because Angelina Jolie climbed all over it when it was used as a set for the Tomb Raider movie. Either way, it is a phenomenal sight to behold! If the temples of Angkor Wat speak of the strength of structure, Ta Phrom speaks of the power of nature – to see the two so beautifully entwined in an almost symbiotic relationship was surprisingly stirring or perhaps I was just so relieved that there were no steps to climb and it was time to go home! It was late afternoon by the time I returned to my guesthouse with just one thing on my mind… a shower! I washed away the exertion of the day and absolved myself from any further tourism. I pottered in my room for a while before making one last effort to head into town for a hard earned beer. I may have started the day In the Mood for Love but I’m ending it well and truly in the mood for sleep!